A few months ago I wrote a blog post that bemoaned an unfortunate truth: A lot of high end running shoes are really ugly. Much to my surprise, this post got a lot of attention out there on the interweb. Strangers commented. People search for the term “why are running shoes so ugly” on a daily basis. It’s one of the most popular posts I’ve ever written, and it keeps getting traffic week in and week out. It’s time for me to buy another pair of running shoes, so naturally this ugly shoe issue has been on my mind again. Right now I’m leaning toward a pair of Asics Kayanos that are gray and pink. Yes, pink, a color I despise. But it’s one of the only Kayano models available right now that doesn’t look like it was designed for a disco clown going to a Palm Springs rave. Just this week I finished reading the fantastic “Born to Run” by Christopher McDougall. I was late to the party on this book, which was mostly as good as everyone said. I was more interested in the culture of the Tarahumara Indians, though, and McDougall spends a lot of time delving into the evolutionary science that allows us to run and the pros and cons of conventional running shoes. Back at square one: I need to buy shoes and I don’t like the way they look. I scrolled through a slideshow of the “25 Best Running Shoes of 2013” and found most to be away from my taste. There were two I found acceptable, but both were for trail running. I tend to stay away from trails, as they are great places to sprain my ankles. At this point I was laughing so hard that I had trouble getting back to my original mission. Focus, Etling! I scrolled through the 2013 Summer Shoe Guide. Overwhelming shades of lime green, neon yellow and orange sherbert made me crave margaritas and frozen yogurt. How about some simple blues, reds and grays, shoe companies? Is that really too much to ask? I jumped over to the Spring Shoe Guide. Here I found something that didn’t totally offend me – the Asics Gel Lyte 33 2. Classic Asics design with a deep blue hue. Hmmm. I might have to give these babies a try. If I was still a fast runner, I’d even venture to the Newton Gravity Neutral Performance Trainer. Their flashy red blue and yellow combo is Olympic-caliber, though, and my mile splits aren’t speedy enough to pull that off, especially at a $175 price point. For now, I am still running in the Kayanos I purchased six months ago. The heels are completely worn out and they smell like a dead animal. Maybe the Tarahumara were right. Sandals made out of old tires might be a better way to go. 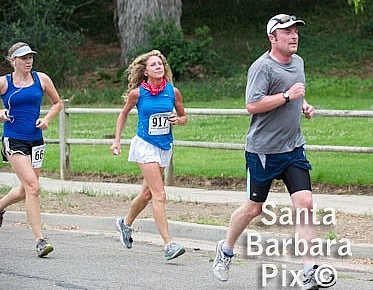 At my most recent 15K, Semana Nautica in Goleta on July 4. I am new to running and I bought my first pair of running shoes today. I had no idea what to look for, but I knew the prospects were going to be ugly. After no luck in big box store I went to a local running store and let the sales lady pick out shoes for me to try based on her evaluation of my needs. I ended up with sliver/purple/turquoise Ascics GT-1000s. Things could have been a lot worse. At least there’s no fluorescent orange or lime involved.